A major reason for this disparity is Montana’s vast geography and sparse population. Spread out over the state, manufacturers often don’t know of each other’s existence. Without contact with other businesses, they are often unable to build the beneficial relationships enjoyed by manufacturers and industrial service providers in more urban settings. The University of Montana’s Bureau of Business and Economic Research, along with Montana State University’s Montana Manufacturing Extension Center and the Montana Department of Commerce , have built the Montana Manufacturers Information System (MMIS) to address the geographic disadvantages Montana manufacturers face. The MMIS brings Montana Manufacturers closer to each other electronically, if not physically, by providing detailed and uptodate information about each manufacturer's products, processes, and capabilities in one free easily accessible website. In 2016 the Montana Department of Natural Resources & Conservation created the Montana Wood Products Directory to facilitate and encourage the use of Montana wood products. This directory uses data from the Montana Manufacturers Information System to populate the directory. Any company that is in the MMIS and is also a Montana wood products company will be listed in the Montana Wood Products Directory thereby expanding its exposure to potential customers. 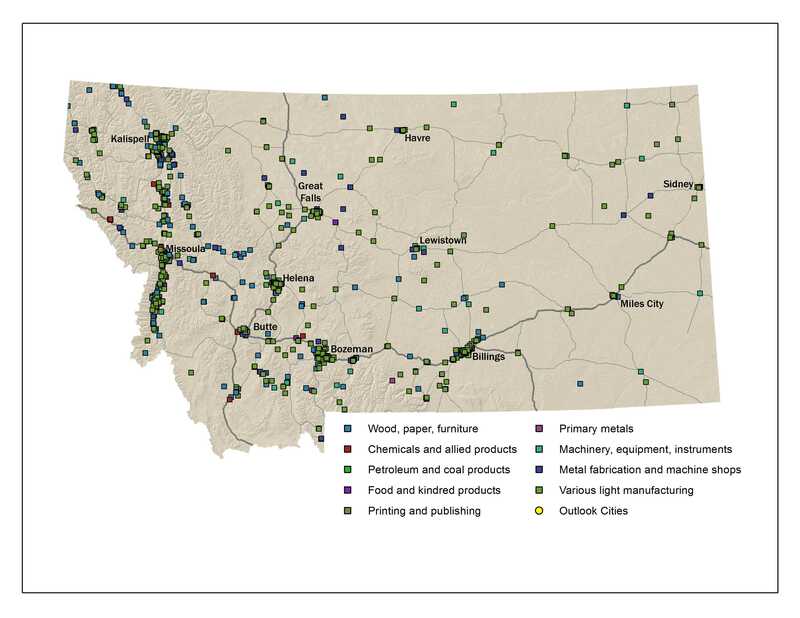 analyze the condition and outlook of Montana’s manufacturing industries. We have been adding Montana manufacturers to the MMIS by sectors, starting with wood product manufacturers. We have added firms that manufacture machinery, equipment, instruments and fabricated metal products and are currently adding firms in the various light manfuacturing sectors. The MMIS can be searched by keywords or terms and has several ways to browse the manfuacturers in the system. Participating manufacturers can update and add to their profiles at any time using a password supplied by the system. Manufacturers not currently listed will soon be able to add themselves. The MMIS does not provide lists of addresses, emails or phone numbers to commercial interests. The Bureau of Business and Economic Research, and the Montana Department of Natural Resource Conservation does not guarantees that information contained in a manufacturer's profile is accurate or timely. Any user of the information contained in the MMIS should directly verify that information before acting on it. Funding for the MMIS was provided by the U. S. Department of Commerce 's Telecommunications Opportunities Program and Economic Development Administration with funding for enhancements and updates from the BitterRoot Economic Development District.